Today my friends I would like to discuss a painful arthritic condition that affects many people and that is Gout. What is gout, what causes it, some facts about gout, and some natural remedies that may help you gain control of your gout and the painful effects. about 2 million people have gout. 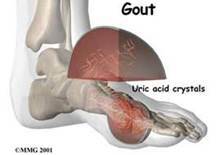 Gout results from the buildup of uric acid in the blood. Uric acid is the result of the breakdown of waste substances, called purines. Uric acid is dissolved in our blood and normally eliminated in our body through our kidneys, but in some people there is an excess amount that the kidneys are not able to eliminate fast enough. When this occurs too much uric acid accumulates in the blood, it crystallizes and collects in the joint spaces, causing gout. What causes build up of Uric Acid? Certain medications, including diuretics ( prescribed for high blood pressure, edema or, cardiovascular disease, salicylates (the active ingredient in aspirin), and levodopa (used for Parkinson disease). Food allergies may lead to gout. When people who are sensitive to certain foods eliminate them from their diet many find that their gout goes away, too. eliminate coffee and all other caffeine sources from the diet. high fiber diet also aids in the elimination of uric acid by absorbing bile acids formed in the liver. These bile acids can act as a precursor to uric acid. Drink plenty of water the recommended 8 – 8 oz– which will help flush uric acid from the system and prevent urate crystal deposition. Eat tart cherries in all forms – fresh, or as cherry juice, or in the form of tart cherry extract. According to Dr Weil– Laboratory findings at Michigan State University suggest that ingesting the equivalent of 20 tart cherries inhibits enzymes called cyclooxygenase-1 and -2, which are the targets of anti-inflammatory drugs. Take bromelain, a compound of digestive enzymes and other compounds extracted from pineapple stems. Blueberries are high in anti-inflammatory compounds called anthocyanins, which help ease the pain of gout. Strawberries Eating a cup of strawberries with each meal should bring quick relief. They neutralize uric acid. Fruits & Vegetables –Eating generous amounts of other helps keep uric acid crystals in solution. Lemon juice — prevents gout attacks by stimulating the formation of calcium carbonate in the body. After each meal drink the juice of one freshly squeezed lemon in a glass of lukewarm water. Baking Soda – Take 1/2 teaspoon of baking soda with meals will alkalize the body and help prevent gout attacks. Devil’s claw root is useful for getting rid of gout because of its ability to lower uric acid concentration and because it helps flush out toxic waste. Several studies have shown that this herb has helped reduce pain in gout patients and has also been found helpful for arthritic conditions. Bilberries can be helpful in treating Gout because they contain many antioxidants, that help to reduce uric acid levels. Antioxidants are important in helping reduce the intensity or occurrence of attacks. You can use it as a supplement form or herbal tea. Stinging Nettle or Nettle Root — it helps lower uric acid. It contains vitamin C which studies show helps reduce uric acid levels when used on a consistent basis. One study showed up to a 50% decrease. It also contains Potassium which takes uric acid and puts it in an easier form for the body to eliminate. Other benefits are –it is a diuretic and can help alleviate symptoms by getting the kidneys to excrete excessive acid and a natural antihistamine helps reduce swelling. Nettle can be used in soups, infusion teas, and in extracts. B. Soak the foot in a mixture of 1/2 cup of ACV and three cups of hot water. Black cohash moderates blood acidity, therefore will help reduce Gout. Buchu tea helps dissolve and flush out uric acid crystals. Garlic Eat several cloves of raw garlic daily. Mince the garlic and add it to black cherry juice for a potent remedy. Ginger—- Put 1/3 cup of ground ginger (buy in bulk to keep the cost down) in a bathtub of water and soak for 30 minutes. This will cause you to sweat (a good thing) which will help eliminate the uric acid from your tissues. When you are finished the bath be sure to rinse off thoroughly, as the ginger can cause skin irritation if it dries on your skin. Quercetin— The flavonoid quercetin inhibits uric acid production in a similar fashion to commonly prescribed drugs for gout. Take 1000 mg of quercetin along with 1,000-1,500 mg of the enzyme bromelain (to enhance absorption) two to three times daily between meals. Charcoal— Take 1/2 -1 teaspoon of activated charcoal daily. Make a poultice using 1/2 cup of activated charcoal, 3 tablespoons of ground flaxseed and warm water to draw out the toxins. DMSO (dimethylsulfoxide)— is very effective in relieving pain and swelling caused by inflammation. It helps dissolve crystalline deposits. Meadowsweet — is known for having anti-inflammatory properties. It is useful in treating aches and pains associated with gout, arthritis, and rheumatism. Feverfew — is known for reducing pain and swelling of arthritis, gout, and rheumatism.——–you can make an herbal tea or eat 3 fresh leaves every 2nd day in a slice of bread. Yarrow–Make a tea by using equal parts of yarrow and stinging nettles; strain, cool and drink several cups a day. Celery seeds –are quite effective in relieving gout by eliminating uric acid from the body.– According to James Duke, Ph.D., a medical botanist formerly with the U.S. Department of Agriculture, celery seeds contain about 20 different anti-inflammatory agents. Although there is little scientific research on celery seeds, according to Kerry Bone, a leading expert on herbal remedies in Australia, “it (sic) works brilliantly in patients.” Recommended dosage is 500 mg (standardized to 450 mg of celery seed extract) 2x daily. Gout-Gone – is a safe, non–addictive, FDA–registered natural remedy containing 100% homeopathic. Conventional medicine normal treatment for Gout is non-steroidal anti-inflammatory drugs (NSAIDs) such as ibuprofen to keep inflammation and pain under control. Corticosteriods can have a similar effect; these are administered via pills or injections. There are also medicines that can lower levels of uric acid, the best known is probably allopurinol (Zyloprim). According to Dr. Weil these should only be used as a last resort, as all carry the risk of significant side effects. I always believe it is better to use a natural remedy over a prescribed medication that can have many dangerous side effects. Eating healthy and avoiding any toxic chemicals is extremely important to keep your body healthy and disease free. “Go Green” & “Organic” to Live A Healthier Lifestyle! thank you so much for this post. Blessings..